Hanoi (VNA) - The increasing amount of smart urban areas and green buildings has triggered demand for environmentally-friendly building materials in Vietnam, experts said. According to Le Trung Thanh, Director of the Vietnam Institute for Building Materials, construction works were increasingly paying attention to durability, energy saving, cost and climate adaptation. Thanh said the building material industry should focus on developing new materials friendly to the environment. Environmentally-friendly materials must meet two requirements: consuming less energy for producing it and saving energy when put into use. The production and use of green construction materials is an inevitable development trend, not only in Vietnam, Thanh said. The Ministry of Construction estimated that the country’s demand for building materials would grow at about 10-12 percent per year. Demand for green construction materials grew significantly in the past five years and is set to soar in the near future as dozens of provinces and cities try to become smart cities. 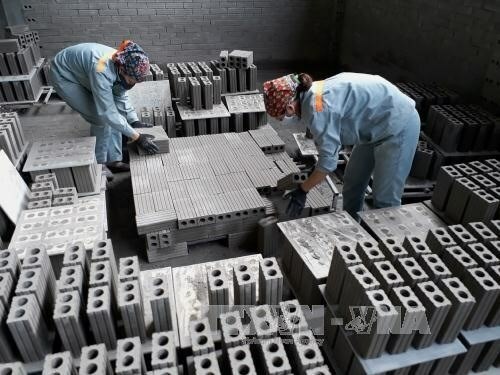 Currently, Vietnam can produce some green construction materials such as insulation foam, eco-friendly roofing sheets, light-weight concrete bricks, glazed tiles, green walled wood, recycled bricks and green cement. The country has also encouraged the use of unbaked bricks as well as energy-saving equipment and materials in construction works over the past decade. According to Pham Van Bac, director of the ministry’s Department of Building Materials, besides developing new construction materials, producers of traditional products such as cement, tiles, steel and glass also needed to renovate production technologies to increase durability, energy saving, climate adaptation and cut production costs. Nguyen Thanh Hai, chairman of Hi-Pec which specialises in paint products, said that green construction was a trend but many were still hesitant due to the high costs for eco-friendly materials.